This small table is a teaching aid for pregnant or new mothers in the first few weeks of their breastfeeding journey. Colourful graphics with minimal text provide an at-a-glance look that new parents find particularly helpful. 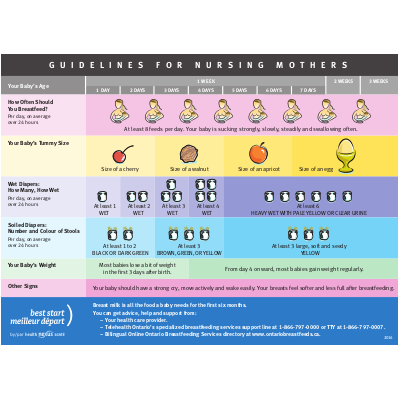 Provides information on Breastfeeding frequency, tummy size, number of diapers, and baby weight. Print it so they can hang it on their fridge door! Also available in French, Arabic, Bengali, Chinese, Cree, Farsi, Gujarati, Hindi, Korean, Ojibway, Punjabi, Russian, Serbian, Somali, Spanish, Tagalog, Tamil, Urdu and Vietnamese.